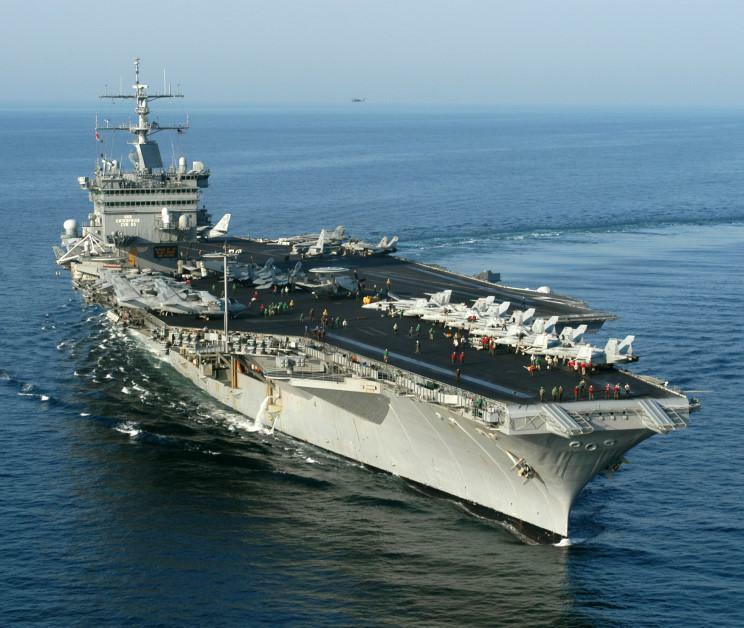 THE United States, Britain and France delivered a pointed message to Iran, sending six warships led by an aircraft carrier through the sensitive waters of the Strait of Hormuz. The deployment challenged Iranian threats to close the waterway and coincided with an escalation in the West's confrontation with Iran over the country's nuclear ambitions. European Union foreign ministers were expected to announce an embargo on Iranian oil exports overnight, amounting to the most significant package of sanctions yet agreed. They are also likely to impose a partial freeze on assets held by the Iranian Central Bank in the EU. Tehran has threatened to block the Strait of Hormuz, where tankers carrying 17 million barrels of oil pass through every day, in retaliation. The USS Abraham Lincoln, a nuclear-powered aircraft carrier capable of deploying 90 aircraft, entered the Gulf without incident. All three countries retain a permanent military presence in the Gulf, but a joint passage through the Strait of Hormuz by all their respective navies is highly unusual. The flotilla will have passed within a few miles of the Iranian coastline. European Union foreign ministers have formally adopted an "unprecedented" oil embargo against Iran over its nuclear programme, banning all new oil contracts with the country. They also agreed a freeze on the assets of Iran's central bank in the EU. The EU currently buys about 20% of Iran's oil exports. There was no official Iranian reaction, but one Iranian lawmaker played down the decision, calling it a "mere propaganda gesture". Iran had "failed to restore international confidence in the exclusively peaceful nature of its nuclear programme", British Prime Minister David Cameron, French President Nicolas Sarkozy and German Chancellor Angela Merkel said in a joint statement. "We will not accept Iran acquiring a nuclear weapon. Iran has so far had no regard for its international obligations and is already exporting and threatening violence around its region," the leaders added. The measures were "another strong step in the international effort to dramatically increase the pressure on Iran," US Treasury Secretary Timothy Geithner and Secretary of State Hillary Clinton said in a statement welcoming the move. Meanwhile, the International Atomic Energy Agency, the UN's nuclear watchdog has confirmed it is sending a team to Iran between 29 and 31 January "to resolve all outstanding substantive issues". Last November the IAEA said in a report that it had information suggesting Iran had carried out tests "relevant to the development of a nuclear explosive device" - sparking the decision by the US and EU to issue tougher sanctions. 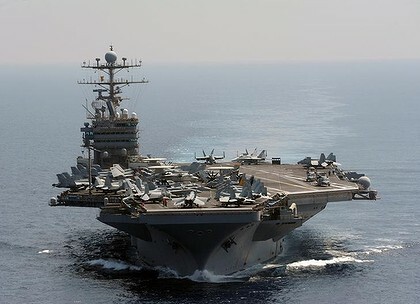 Earlier on Monday, the Pentagon said the US aircraft carrier USS Abraham Lincoln, as well as a British Royal Navy frigate and a French warship, had passed through the Strait of Hormuz at the entrance to the Gulf without incident, in the wake of Iranian threats to block the trade route. The EU said the sanctions prohibit the import, purchase and transport of Iranian crude oil and petroleum products as well as related finance and insurance. All existing contracts will have to be phased out by 1 July. Investment as well as the export of key equipment and technology for Iran's petrochemical sector is also banned. Additional restrictions have been placed on Iran's central bank and in the trade of gold, precious metals and diamonds. BBC Europe Editor Gavin Hewitt says it is one of the toughest steps the EU has ever taken. EU foreign policy chief Catherine Ashton said the purpose of the sanctions was "to put pressure on Iran to come back to the negotiating table". Earlier, UK Foreign Secretary William Hague said the embargo showed "the resolve of the European Union on this issue". "It is absolutely right to do this when Iran is continuing to breach United Nations resolutions and refusing to come to meaningful negotiations on its nuclear programme," he added. But the Russian foreign ministry said it was a "deeply mistaken" move that would not encourage Iran to return to the negotiating table. "It's apparent that in this case there is open pressure and diktat, aimed at "punishing" Iran," it said in a statement. Ali Adyani, a member of the Iranian parliament's energy commission, was quoted by the semi-official Fars news agency as saying the EU decision "would only serve some American and European politicians". "It will not have any effect on Iran's economy," he said, adding that Tehran could sell oil to "any country" despite the ban. BBC Iran correspondent James Reynolds says oil is the country's most valuable asset and sales help to keep the Iranian government in money and power. A decision by the EU to stop buying from Iran may damage the Iranian economy - but in itself it won't destroy it, our correspondent says. Iran has already threatened to retaliate by blocking the Strait of Hormuz at the entrance to the Gulf, through which 20% of the world's oil exports pass. Late last year Iran conducted 10 days of military exercises near the Strait of Hormuz, test-firing several missiles. Oil prices have risen already because of the increasing tension and the expected impact of an EU ban on oil supplies to Europe. For Sale: Well head valves WKM 2" 5M S.S.